In a bold change of German policy in Afghanistan, Chancellor Angela Merkel reiterated Germanyâ€™s denial to commit troops to help fight a Taliban insurgency in the southern half of that country. 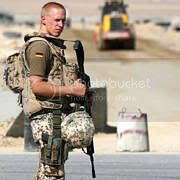 Some have of late criticized German forces for insisting upon remaining in the more tranquil, bird-tweeting and poppy-scented northern half of Afghanistan while other NATO troops bare the brunt of Taliban terror and risk their lives in military skirmishes in the notably less picturesque south. The German foreign ministry has vehemently denied these accusations however, and was quick to point out the many hardships German troops have been forced to endure down/up there; lack of German beer, LeberkÃ¤se and live â€œWetten, Dass..?â€ broadcasts, just to name a few. Merkel did however knuckle under on one point and concede to let German troops conduct â€œemergency rescue missionsâ€ in southern Afghanistan. No user commented in " Germany’s unconditional conditional Support in Afghanistan "